The majority of my work is historically-based interpretations of original types and styles, although I am occasionally commissioned to make exact replicas. My intention is to engage today’s audience in appreciating a wide range of decorative possibilities inherent in hand made traditional pottery, such as redware and delftware. I am drawn to the original makers of these styles for their tenacity and quirky habits. Their practical approach, making do with what is at hand, also has much to offer potters (and everyone) today. I also enjoy the history of the forms the old potters produced. Certain forms travel down through the ages virtually unchanged while tracking the ‘family tree’ of other forms is like a game of telephone played out across centuries and continents. I bring decades of pottery experience and extensive research to the creation of this time-honored, hand made, and food safe pottery. My Undergraduate studies included West African art history under renowned historian Christopher Roy, and an unforgettable stint on an archeological dig in Cote d’Ivoire (the Ivory Coast in West Africa). After I graduated from the UI with a B.F.A. in Ceramics, my education took a decidedly “traditional” path. 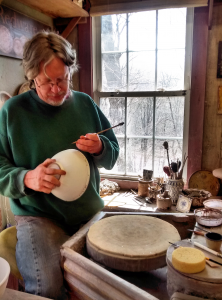 I apprenticed to Richard Bresnahan at St. Johns Pottery in Collegeville, MN. Bresnahan’s own apprenticeship was to Nakazato Takashi, a 13th generation Japanese “National Living Treasure” in Karatsu, Japan. St. John’s Pottery emphasized traditional Japanese learning practices, augmented by Bresnahan’s insights into the artisan’s role in today’s society. After my apprenticeship, I worked in Nicaragua with Potters for Peace, a craft assistance organization, on various ceramic development projects. What some in the U.S. might consider “folk” art was in Nicaragua an essential component of a subsistence economy. Much of my time in Nicaragua involved work in communities that, but for occasional plastic buckets and clothes donated from Salvation Army, it could have been 200 years ago. Upon returning home, I felt I knew more about the ceramic traditions of the world than I did that of my own back yard. Wishing to explore the history of my new home in Massachusetts, I worked at Old Sturbridge Village (O.S.V.) in Sturbridge. Here I first encountered New England Redware. My experiences with traditional African, Japanese, and Central American pottery allowed me to see Redware as part of a global continuum of craft expression on a communal level. I belong to a small but thriving group of potters who honor early masters by emphasizing traditional and historical themes in our work. We want to preserve and expand the narratives that have defined our communities from the colonial era onward. A variety of institutions and people purchase and enjoy my work. These include living history museums, historical societies, folk art galleries, traditional arts and crafts fairs, historic home shows, along with re-enactment groups, collectors, and members of the public who might not otherwise be exposed to traditional art. The work I produce allows people to use and enjoy objects that reflect one of the essential components of our national craft heritage.